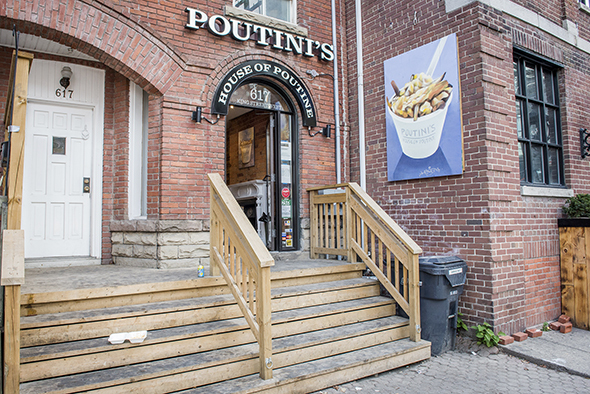 Poutini's on King West and their original location on Queen Street are one-stop shops for great handmade poutine. They're known for their gigantic portions, as well as their late hours: yes, this location is also open until 3:30 in the morning on Fridays and Saturdays. I guess Poutini's wasn't satisfied with the throng of late night revelers that pack the Queen location on weekend nights, and decided to open up in an even clubbier location on King, near Portland street, the place to see, be seen, and eat some of the best food in the city. 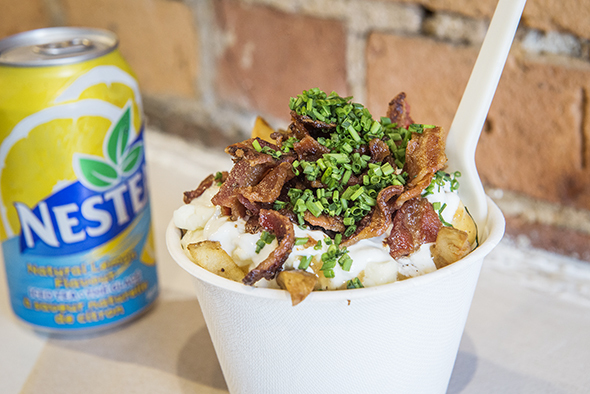 That said, if you want to get great poutine but don't love loud atmospheres and crowds, try hitting it up for some lunch or even midday hangover breakfast. The party is always going at Poutini's, playing the latest Brooke Candy or throwbacks from Britney Spears. The interior is small but warm, with just a few seats inside and bench seating outside in the summer. 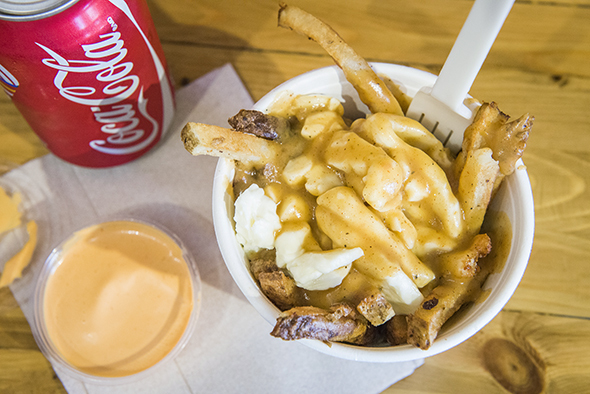 While we're here...gotta sample some poutine, right? I've eaten their creations dozens of times in as many states of mind, and they're always satisfying. The teeny size is still sixteen whopping ounces of poutine, definitely a whole meal, even if it's just the traditional ($5.30 for teeny). They use fries you can watch them hand-smash while ordering at the counter in all their poutine. 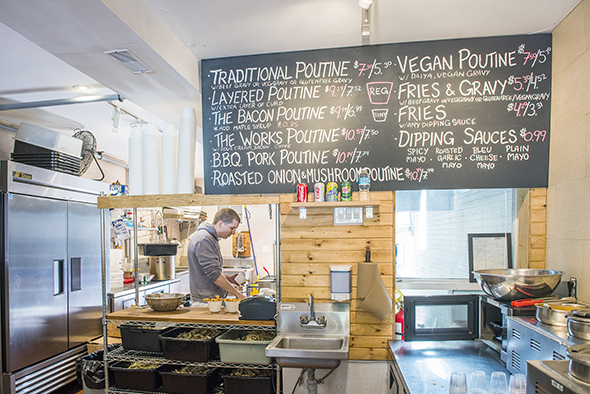 The potatoes are russet, and there are three options for gravy with each poutine: regular gravy made with beef stock and butter, vegetarian gravy made with veg stock, and a vegan gluten-free gravy with no butter or flour. And c'mon guys: no ordering the vegan gravy with extra cheese curds. Go whole hog and have "the works" ($7.50) instead, topped with bacon, sour cream and chives. I love how they smush the exact right amount of curds onto the poutine here, putting them into four ounce (teeny) or six ounce (regular) containers to measure them out beforehand. 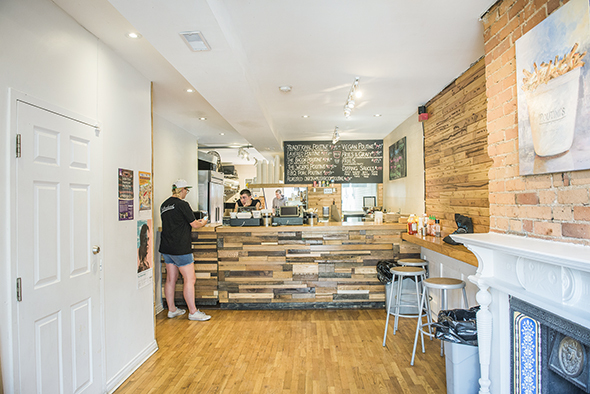 Owner of Hawker Bar Fred Laliberte lets brother Nick use the smoker in his bar to smoke pork for the BBQ pulled pork poutine ($7.79) that they then pull by hand. The BBQ sauce it's soaked in is house-made. 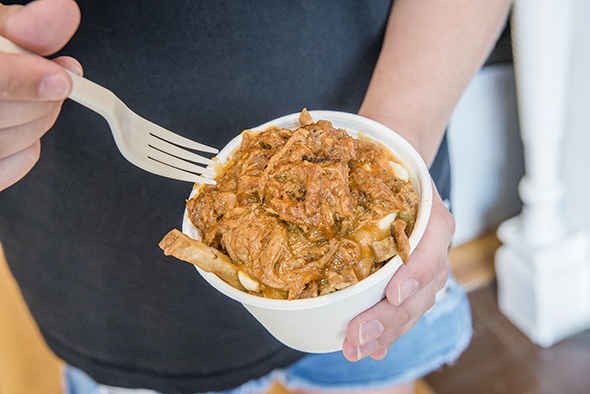 So I mentioned the so-called "teeny" is sixteen ounces of poutine: well, the "regular" doubles that for thirty-two ounces, making a regular layered thirty-two ounces of poutine that contains twelve whole ounces of cheese curds. I dare you to give that a shot. Poutini's does little dipping sauces like bleu cheese mayo and hickory smoked mayo, and sriracha, vinegar, ketchup and mustard are available.